Our Research Center contains items relating to the history, geography, government, genealogy, culture, and customs of Maryland, with the bulk of the collection relating to St. Mary's County. Records that are available contain a variety of items ranging from maps, surveys, business records, and government records, club and organization minutes, school records, diaries, marriage licenses, music, ships' lists, newspaper clippings, family genealogies, letters, almanacs, telephone directories, postcards, family movies, documents of all types, military records, church records, paintings, books and more. The Research Center is located on the second floor of Tudor Hall. The Center is open on a regular schedule and is staffed with volunteer researchers to assist you. A small fee is charged to non- members. 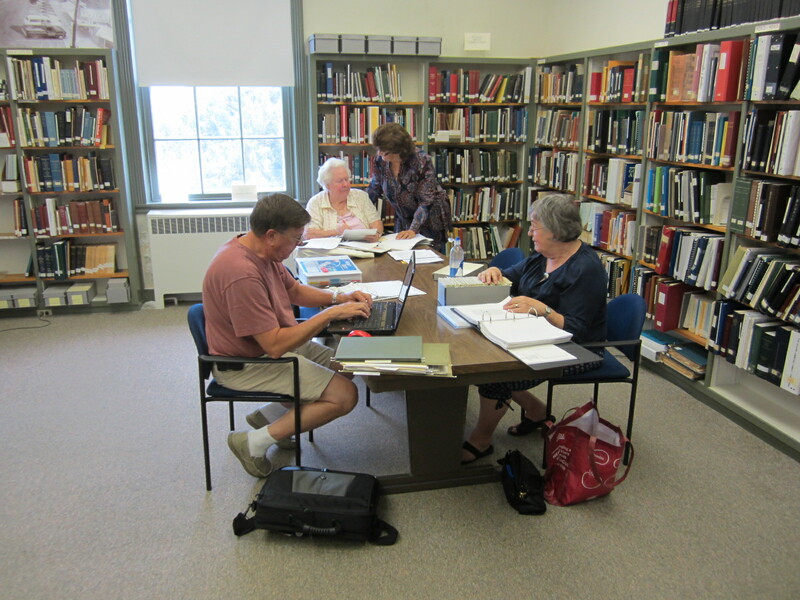 Based on their availability, our genealogists will conduct research by request on a first-come first-served basis for a fee to help the Historical Society. Please contact the Society for research availability! Note: Research materials do NOT circulate. African-American Research Guide: A Research Guide to African-American Genealogical Resources Available at the St. Mary’s County Historical Society (SMCHS). Chronicles of St. Mary's: 1953 to present, some bound and indexed. Use our desktop to display & read issues. View Subject/Author Indices years 1953-1999 or 2000-Present. Birth/Baptismal Records: Birth Index of St. Mary's, Charles and Calvert Counties from 1898 to 1919 is available. For earlier births, extant church records must serve. 1744-1915 (not complete). Microfilm transcribed on to cards. ​Churches and Parishes: See: Research Guide to Church and Parish Resources Avaiable at the St. Mary's County Historical Society. November 2017. Marriage Records: St. Mary's County marriage records began in 1794 and are available and are extant to date. Marriage data from all known sources, including official, church, newspapers, and inferred data from probate court and other sources, have been compiled and published in Marriages and Deaths in St. Mary's County, Md. 1634-1900, by Margaret K. Fresco. This book is also available from our bookstore. Death Records: Deaths occurring in Maryland counties were not officially registered before 1898. As with births, extant church records and other sources must be used. Deaths from all known sources up to 1900 are included in the book cited under Marriage Records, above. Probate Records: St. Mary's County wills, 1658-1969, are available on microfilm. Other probate records from 1634-1788 are at the State Archives in Annapolis, some of which we have in transcribed hard copy; wills dated 1658 to date are available for research at the Courthouse in Leonardtown Md. and to 1960, on microfilm in our collection. Land Records: St. Mary's County Deed Books, 1637-1831 burned in the Court House fire of 1831. Except for a volume of re-recorded deeds beginning in the late 1700s, deed records begin in 1831. There are other series of land records that help to replace the lost deeds. Patent (Land) Records 1,2,3,AB&H,Q and 4: 1637-1661: microfilm. Proprietary Manor Leaseholds:1700 - 1768: Hardcopy Book, Gauis M. Brumbaugh, V2. Provincial Debt Books: 1753-1774 (except 1772): microfilm & Land database. Deed Abstracts: 1786-1829: Indexed microfilm. Also indexed & bookmarked PDFs. Tax Assessment Records: 1793-1846 (not inclusive): microfilm and/or index cards. They are also available in a transcribed/indexed hard copy & PDFs. Alienation and Transfers: 1786-1829: microfilm & PDFs. Benjamin Tippett's Journals A & B, ca 1840-1870, microfilm & PDFs. George B. Dent's Journals A thru F, ca 1860-1905, microfilm,hard copy & PDFs. Military Records: The majority of military records prior to 1831 including all Revolutionary War records burned. Prisoner lists for Point Lookout Prison Camp for Confederates are available on microfilm. Newspapers: The St. Mary's BEACON, 1852-1960, and The St. Mary's ENTERPRISE, 1883-1989 are available on microfilm. The St. Mary's County Library System has begun digitization of the Enterprise beginning in 1923. Those are available at the libraries in St. Mary's County and here at the Historical Society as well as online. Some issues are missing from both series but there is an inventory of issues for each newspaper. In the future we hope to help provide both the Beacon and the Enterprise online. Subject Historical Files: Material relating to history, government, geography, culture and customs of St. Mary's County, 12 file drawers. Family History Files: Research records relating to specific families, 19 file drawers. Some of the above records have been published and are available for sale at the Bookstore or via mail.